Thanks to Osman for his help in getting this working originally for me! 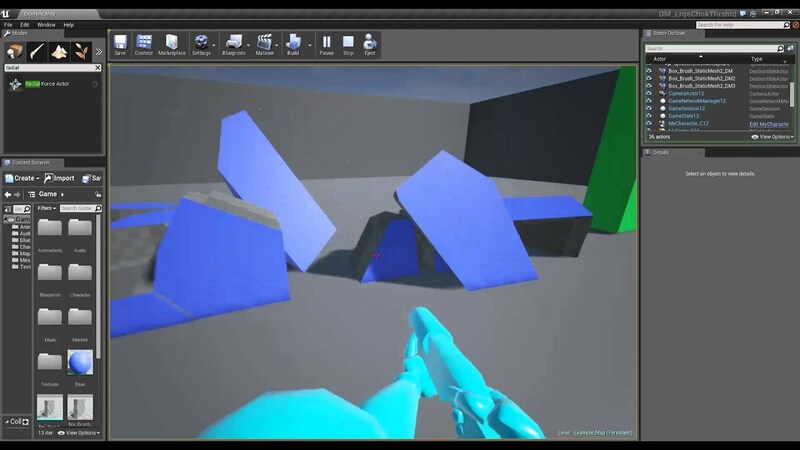 In this tutorial we will take a physics simulation created in Max (sub in your own modeling software if need be) and baked to the animation timeline and bring that into Unreal Engine 4 without the need to rig, skin, or use any bones for the chunks that are being animated. **This will not cover using PhysX Labs plugin or MassFX to bake the animation to the timeline. This will assume you've already gotten to that point and start from there to UE4. After you've grouped your pieces we can export. Select your group and choose Export Selected. When you import the FBX into UE4 make sure that you've selected the option for "Import as Skeletal" for this to work correctly. Place your skeletal mesh in your scene and create a reference to it in your Level BP and pull off a the pin to create a "Play Animation" Node. Select the animation and whether it should loop. Then Play in Editor which should result in this. This technique was used extensively in the Elemental Demo for the destruction when the Lava is flowing and shattering the rocks. I hope you've enjoyed this and if you have any questions feel free to ask! EDIT: Apparently I left my music playlist playing in the background. Enjoy the music courtesy of Star Trek. Last edited by Tim Hobson; 01-22-2015, 08:38 PM. Destructible How-To 3: How to use "Large Chunk Threshold"
This video will look at how to use Large Chunk Threshold in your Destructibles component settings in the Details Panel. What is Large Chunk Threshold? Quite simply this is the minimum size that each chunk must be to be considered a large blocking chunk to prevent the player from passing. Anything that is below this threshold will not block the collision capsule of the player. This is extremely great in circumstances where you want to have destruction with smaller pieces that do not obstruct the player from reaching the goal, which can happen with smaller threshold levels. Test and tweak accordingly to get the best results! DM 1 is set to the default of 25. DM 3 is set to 500 which means that none of the chunks are larger than that value so the player can walk through all the chunks. Keep in mind that this is only for the chunks and does not apply to the DM before the fracture occurs. Last edited by Tim Hobson; 01-23-2015, 04:46 PM. A while ago I had an AnswerHub question that asked could there be different lighting baked for levels that occupy the same place. The goal was to have a Day and Night version of the same place. This is possible with some doubling of assets and using level streaming to handle the switch. With this demo for the question I set up my base level (persistent level) that would handle the Level BP with the level streaming switch. Then I would setup two additional levels. 1 for the Day and 1 for the Night. You will see that each map I duplicated everything so that I could have the day setting and the night settings for their respective map. This is a broad example just to show the technique is possible. Just press Play to see the results. If you look at the level BP you can disable the event begin play and load in by key press of F for Map 1 and G for Map 2. Last edited by BrUnO XaVIeR; 01-24-2015, 07:59 PM. Those look like a lot of fun BrUnO! A lot more fun than my simple setup. This will be a short tutorial to quickly cover creating a simple cloth asset and importing it into the Unreal Engine 4. There have been similar tutorials already, but mostly wanted to cover a written tutorial for this. The video is just an added bonus as I had made it while troubleshooting the process for an AnswerHub post. Video: This will not cover much other than a run through of the process. Pretty straight forward. Create a plane and add some verts to it. I just used an arbitrary size and set the length and width segments to 24 for this demonstration. This, at least to me, is a very important step that confused me quite a bit when I first started using cloth. If you do not apply a default material to your mesh and use the one that is on the mesh when you created it there will be no material assigned to the cloth asset when you import it into UE4. So make sure to add a default material otherwise you'll not have a material to be able to assign the cloth apb file to your mesh later when imported into UE4. Create a bone that we can use in the next step to "skin" to our mesh. Add a skin modifier via the drop down modifier list to your cloth plane. Once the modifier is selected locate the Bones: "Add" button and click this. This will bring up a small window where you can select the bones in the scene to skin your mesh to. Once this has been added you will see it populate in your modifier stack along with its settings when selected. Under the settings locate "Paint" and set a value for the Brush Value. I will use 200 for mine. The default is 0 which effectively means there will be no cloth simulation for any areas painted with a 0 weight. Select the brush to paint the weighting. As you paint you will see red trace lines that come out. This is the 200 cm value that we used. If you use higher or lower values this will be longer or shorter. 0 will have no trace lines. Select the play button here to see your cloth simulation. If you want to see wind simulation to see a more practical use of your cloth in the settings locate the Wind section and use these settings before hitting play. Adjust according to your needs. Same as above with exception that we will just export the scene this time and not just the selected object. 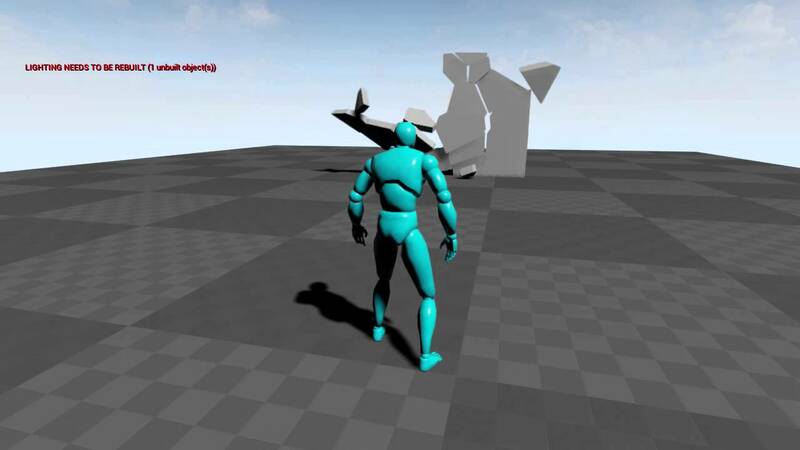 Locate your FBX that was first exported with just your Cloth plane and bone and import this into UE4. Once that is imported locate the cloth skeletal mesh and open the asset. Once this is opened verify that you do have your material slot. 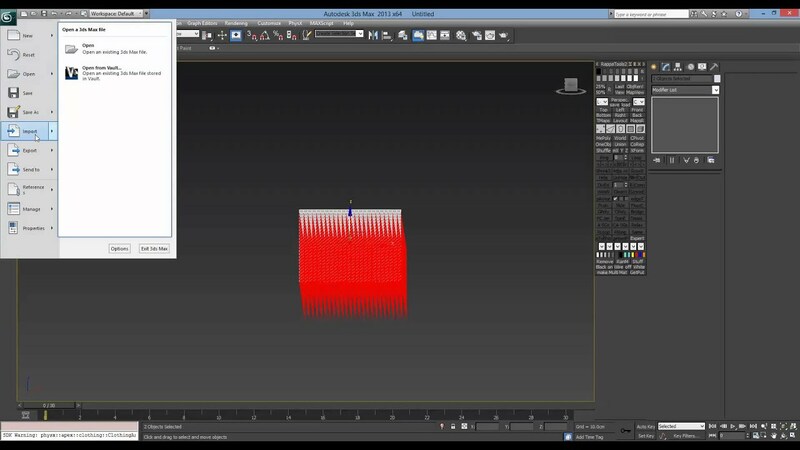 If not, you'll need to go back to Max/Maya and add a default material. Now we'll click the the option to "Add APEX clothing file..." and navigate to where we saved our APB file we created. After importing the apb file you'll be able to assign this to the material via a drop down. You will also notice that you can adjust various settings for your apb file to control how the cloth reacts. These are all settings that can be setup via the PhysX DCC Plugin as well. Last edited by Tim Hobson; 01-27-2015, 04:22 PM. This one is still very much a Work-In-Progress as Eric and I work to get some simple troubleshooting and tips up for everyone. We've wanted to do this for a long time and have gotten a little bit of a push to make this available for those having issues. The majority of these will be simple steps with a little bit of explanation for the "why" of it all. Over the next couple of weeks Eric and I will be updating this regularly as we knock some of these out. If you see anything missing or something you want covered please let me know and I'll add it to our list. - Why are my shadows black? - Two-Sided Lighting for Single Sided Meshes, or Why does my light come through the roof? - What if I don't want to have lightmaps at all or my game doesn't need them? - Why is there a red 'X' over my light? - Why does my Movable light shine through my mesh at far distances? - What does this "Warning: Overlapping UVs" nonsense mean? - How do I generate lightmap UVs in the editor? - Why is there shadow splotches on my static mesh?, or How to clean those dirty lightmaps? - What is the "Lighting needs to be rebuilt" in the Top Left corner error? These are done just not up yet. Last edited by Tim Hobson; 09-01-2016, 08:24 AM. Thx for sharing this tutorials !!! You're totally right on that. I've fixed it now. The Split Screen tutorial images are not showing would you mind fixing them? It's fixed now. Thanks for point it out! Thank you very much for all the tutorials and project files.